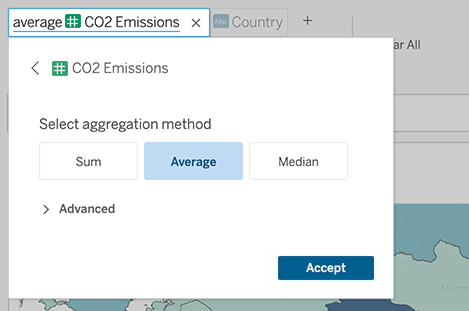 Ask Data introduces an entirely new way to interact with your data, letting you type a question and instantly get a response right in Tableau. Answers come in the form of automatic data visualizations, with no need to manually drag-and-drop fields or understand the nuances of your data’s structure. Ask Data lets you ask sophisticated questions naturally, with support for key analytical concepts like time series and spatial analysis, and an understanding of conversational phrases like “last year”, “earliest”, and “most popular”. Ask Data is available for all user roles with direct access to data sources: Creators, Explorers, and Interactors. Note: Ask Data requires English analytical phrases but works great with non-English data. For example, you could ask “how many pedidos of manzanas” (how many orders of apples) if you have Spanish data with a field named “pedidos” and a value of “manzanas”. In Tableau Server or Tableau Online, navigate to a data source, and then click Ask Data at left. In the text box reading “Ask about fields in this data source”, enter terms from the data source fields at left. Hover over each field to learn more about the data it contains. Unlike the data fields seen in standard Tableau views, these fields can't be dragged to the canvas. As you type, Ask Data automatically completes your entry using likely combinations of data fields and analytical functions. To automatically create a viz, either press Enter, or choose from suggested entries below the text box. Just like that, you've created a compelling visualization of your data! If the default viz doesn't fully reveal your data, either click the menu at upper right, or specify a viz type at the end of your entry with phrasing like “as a bar chart”. Note: To automatically create certain viz types, Ask Data sometimes adds fields like “Number of Records” to your entries. Ask Data gives you several ways to fine-tune how field values are displayed. 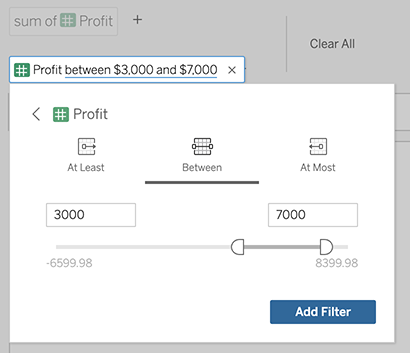 To switch the fields used for the vertical and horizontal axes, click the Swap Axes button above the text box. To change a field or its aggregation type (for example, from sum to average), click the field name in the text box. 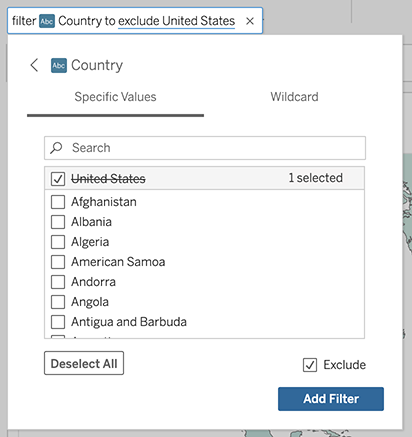 If a field is used as a filter, click the name to specify values or wildcard parameters. To adjust a numeric range, click words like “high”, “between”, or “cheap” in the text box. To delete a field, hover over it and click the X. Save vizzes from Ask Data to combine them with other Tableau views and dashboards in a workbook. 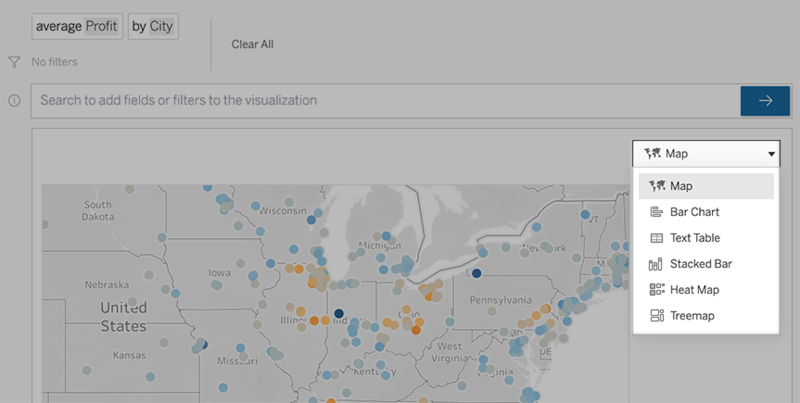 In a workbook, Ask Data is unavailable, but you gain access to Tableau's full range of data analysis and visualization tools. Above the viz, click the save icon , and choose Save as if you're saving the viz for the first time, or Save to overwrite a previously saved version. If you chose Save as, select Embed password for data source if people who lack access will be viewing the viz. Tip: To quickly navigate to the workbook, click the save icon again, and choose Edit workbook. Hover over a data source field at left, click the down arrow, and choose Edit synonyms. Enter synonyms for the field name, separated by commas. Be aware that you can't use synonyms that reflect standard analytical terms like “by” or “max”. Likewise, you can't create synonyms for these special types of data: sets, bins, clusters, hierarchies, combined fields, table calculations, or latitude and longitude. For example, instead of “I want to see all the countries that these airports are in”, try “by airport and country”. For example, if your data source includes Airport Code, Airport Name, and Airport Region fields, specify those by name. Ask Data maps terms like “best” and “worst” to Top 1 and Bottom 1, respectively. If you want to see broader rankings, use “high” and “low” instead. For example, enter “houses with low sale prices”. If you want to analyze long field values that contain more than 50 characters or two separate words, or that include line returns or tabs, surround them with quotation marks. To improve performance, Ask Data doesn't index fields of that length.